Our guide to getting The Division 2's masks, which you can only get by killing hunters. You've probably seen players wearing masks in The Division 2 and, and you might be wondering how you can get hold of them yourself. The process isn't as simple as looting them from apparel caches or buying them, unfortunately: if you want to get your hands on them, you'll need to take on Hunters—the game's level 35 bosses—that are located around Washington D.C. Read on for our guide on how to find them and what you need to do to spawn the Hunters. There are 12 masks in total in The Division 2 and you can equip them in the top-right corner of the apparel menu. As you'll need to follow some fairly complicated steps, as well as take down a tough boss for each, it's unlikely that you'll obtain one by accident while progressing through the post-level 30 endgame. For each of the 12 Hunters to spawn you'll need to complete a task. These guys are no pushover though, so we'd suggest being at least level 30 before attempting to take one down—and it's advisable to bring along some friends to help out as Hunters specialise in taking out Division agents. Once you've killed a Hunter, it will drop the respective mask and there's also a chance of nabbing one of the eight Ivory Keys in The Division 2 if you're lucky. It's also worth remembering that Hunters will only spawn at night. The steps you need to complete in order to spawn the Hunters may appear to be quite random at first glance and you'd be forgiven for missing the cryptic clues found in graffiti around the map. Luckily, many community members searched for and solved the cyphers, making the steps needed to spawn the Hunters much easier for the rest of us. Read on to find out everything you need to do to obtain The Division 2's masks. First off, you'll need to complete the side mission which will introduce you to each Hunter before you can work on any of the tasks associated with it. For the Demon Mask Hunter, you'll need to head due east from the control point at the Demolition Site in Downtown East. This particular side mission ends with a scripted fight which sees you getting electrocuted as the Hunter leaves through a door. Once that's been completed, you'll find the Demon Mask in the same building. Head back to the atrium, look east and you should spot four targets in the windows. Take aim and take out each of the targets from top to bottom and you'll spawn the Demon Mask Hunter below the same windows. Once you've dealt with him, you'll obtain the Demon Mask. To obtain the Wraith Mask, you'll want to head to the Southwest region and, more specifically, the Interstate 395 BN road in the south-east corner. Head to the memorial with the flag and take out the light shining on the memorial by shooting the light on the left-hand side. Ensure you're not in the water by stepping behind the flag, and salute the memorial using the relevant emote. The Wraith Mask Hunter should now spawn in front of you. If you're having trouble getting him to show up, try moving around a bit and saluting from different positions behind the flag. In the Downtown East area, look to the far east to locate the Stronghold. A large building with a sizable courtyard should be visible on the map just below the Stronghold. Move to the south part of the building and use the walkie talkie on the desk then run quickly to the northern section to interact with a telephone. The Crimson Mask Hunter should appear in the middle of the courtyard. Next, you'll want to head to West Potomac Park for the Ghoul mask. Along Henry Bacon Dr NW are three underground entrances situated relatively close together. Head into the southern-most entrance and take the north tunnel into the room with the Echo. You'll find a large map on the wall and a laptop underneath it. Interacting with the laptop will cause the map to light up an "X marks the spot" location. The location you've uncovered will take you to the body of water between the Washington Monument and the Lincoln Memorial. A small shelter can be found here, raised above a shipping crate. Shooting the hanging lightbulb will cause the Ghoul Mask Hunter to spawn. If you're hoping to grab the Midas Mask and the Revenant Mask, you should definitely bring some friends along to help as you'll be taking on two Hunters at the same time. Once you've completed the Potomac Event Center mission, you'll need to head to the swimming pool located to the far western side of the West End region. 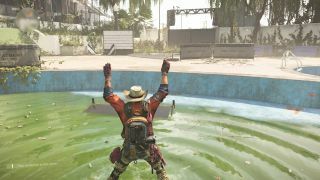 Once there, move to the middle of the pool and use the Jumping Jacks emote. Both Hunters should spawn simultaneously. If they don't spawn, double-check that you've completed the mission in the area as it is one of the requirements. If you managed to take out the two previous Hunters, your skills are about to get tested even further as the next four masks will require you to take on four Hunters at once. On the plus side, doing so will net you the Death Mask, the Cross Mask, the Diamond Mask, and the Phantom Mask. If you're up for the challenge, head over to the East Mall and look for the water resource node north of the Sinkhole control point. Locate the coffee shop on the west side and enter to find a lever by the corner of the counter. Once you've pulled it, run outside and sprint around the Christmas tree until the four Hunters spawn. The final two masks, the Ghost Mask and the Spectre Mask, are slightly different from the others in that we haven't so far been able to get the respective Hunters to spawn. The process to obtain these masks is very different from the rest, and while some of The Division 2's players have managed to get it to work, so far we've been unsuccessful. We have outlined the steps that we believe to be correct below, however, should you want to try it yourself. Firstly, you'll need to take over the Washington Monument control point then head to the supply room to interact with the TV located behind the artifact statue. This should unlock three points of interest on the map. Next, you'll want to take over the Flooded Levee control point. Once done, head to the grassy area in the south-east corner to find a grave then stand at the foot of it and salute. Your UI will react with static if you've done it correctly. Now head back to the Washington Monument and go to the north-east at coordinates 3030,1094. You should find another grave here. Face the Washington Monument and salute once more. Head south-west of the monument (coordinates 2867, 942) to yet a third grave. Salute here then head back to the supply room of the Flooded Levee control point and interact with the TV once more. An orange circle should show up, meaning you've completed this section and won't have to repeat it if you fail the next part. For the Ghost Mask, move north-west of Washington Monument to approximately 2814, 1245 and enter the General Care Monument Field Hospital Missing Persons area. If you look towards the crane, you should spot a Hunter crouched down. Use a high-damage sniper to get a headshot on him, causing him to drop the Ghost Mask if he dies. Finally, to grab the Spectre Mask, head to the small building located at 2886,1100. The last Hunter should be easy to spot on top. Take out your high-damage sniper once more and get a headshot. Once he's down, you'll obtain the Spectre Mask. We haven't been able to get these final two masks ourselves to confirm the steps but other community members have. Also, don't forget, Hunters will only spawn at night.